Sony's always served the budget end of the Android market well and this new model – a replacement for the Xperia E range – continues that trend with a reasonable price point. For that you get a large 5.5-inch IPS LCD screen, NFC, Android Nougat, USB Type-C, expandable storage and even a trusty 3.5mm headphone socket. 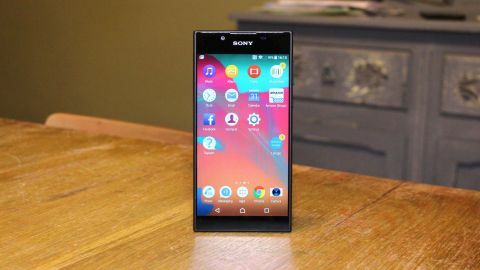 However, behind those positives it's abundantly clear where Sony has had to cut back on things, which means that at times the Xperia L1 feels a little on the cheap side, despite the enviable stature of the Sony brand. The Sony Xperia L1 price is a reasonable one at around $180, £160, AU$240 SIM free. The low unit cost means it can also be snapped up on contract with zero upfront cost and low monthly outlays, if you're in the UK. If you are in the UK, you'll find the Xperia L1 for sale at Carphone Warehouse and on Amazon. For those in the US, Amazon also offers the handset SIM-free. While the rest of the smartphone world follows Apple's lead with gloriously rounded smartphone designs, you've got to applaud Sony for at least trying to offer an alternative. It may have dabbled with pebble-like shapes in the days of the Xperia Play, but now it's all about straight edges and boxy fronts – and the Xperia L1 is no exception. Sure, the sides are rounded so it's easy to grip but the top and bottom of the handset feature – gasp – corners with actual right angles. Beauty is in the eye of the beholder but we have to admit we've got a soft spot for Sony's design language – there simply aren't enough square, boxy phones on the market these days. Unfortunately, many other elements of its design feel budget-level and cheap. It's strange to pick up an all-plastic handset these days when even obscure Chinese firms like Elephone and Maze are producing devices which elegantly combine metal and glass for around the same price. The Xperia L1 is grippy, which is a bonus, but it doesn't feel like a premium handset. It's also rather plain when it comes to little details, on the back we have the camera, LED flash, Xperia logo and NFC touch-point indicator, but that's it. The power button and volume rocker are found on the right-hand side, while on the left there's a plastic flap behind which reside the nanoSIM tray and microSD card slot. Despite the flap clicking into place quite snugly there's no waterproofing or dust resistance included here. On the bottom of the Xperia L1 you'll find the mono speaker, USB Type-C port and mouthpiece mic. At the opposite end there's a secondary noise-cancelling mic and the 3.5mm headphone socket – at least you won't have to invest in a pair of expensive wireless cans if you pick this as your daily driver. The Xperia L1's IPS LCD screen is 5.5-inches in size and has a resolution of 720 x 1280. The pixel density of 267ppi is pretty lackluster, and you can easily pick out individual pixels without having to gaze too closely at the screen. The panel's not all that great when it comes to contrast and things tend to look a little on the yellow side, especially when compared to OLED screens. We also noticed that when you apply a medium amount of pressure with your finger, ripples appear in the middle of the LCD panel, which suggests the plastic framework of the phone isn't providing quite enough rigidity. On the plus side, legibility is good when you're outside, even on a sunny day. Sony has a somewhat strange relationship with fingerprint scanners, as many of the handsets it has sold in North America in recent years have had them disabled. The L1 lacks a scanner altogether, but this is more to do with cost than anything else. Unfortunately for Sony, there are plenty of similarly-priced devices in this part of the market that do come with one – the Moto G5 and Xiaomi Mi A1 being two examples.